Way back in 1987, I started my first post-college job as a sales rep for IBM in the Boston area. I was part of a new business branch and my territory was comprised of about 30 towns in Greater Boston. 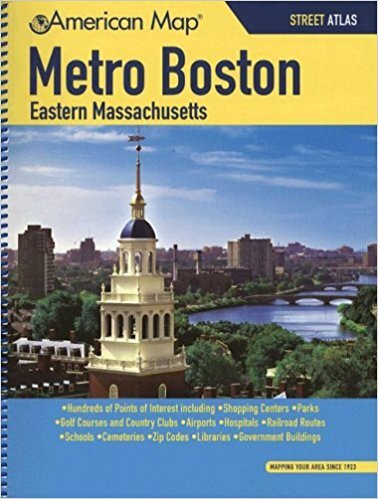 In those pre-GPS days, one of my first purchases was my trusty street map book. For those readers who are too young to have experienced such a thing, I have included a photo below. My map book was an indispensable tool for managing my territory and navigating to customer visits. It did, however, have its limitations. For instance, I had to manually determine the best route to my customer's office, which did not always yield the best results. And if conditions changed, then my initial route was invalidated. My map book lacked the ability to adjust in realtime, alert me of changing conditions, and present clean steps to get to my destination. But in 1987, that was the state-of-the-art. I didn't know what I was missing until I bought my first GPS system in about 2007. Looking back at my marketing plans from that era, they suffered some of the same limitations. My marketing plan was typically printed in a white binder and stored in a filing cabinet in my office. If conditions changed, it was difficult to re-spin my marketing plan to adjust to the new reality. Sometimes we would make some small adjustments to budget or programs, but the plan in its entirety started to get long in the tooth about a quarter into the fiscal year. I don't want to overdo this analogy. Most marketers have good realtime visibility into their program performance and they can make some adjustments along the way. But when there is a major change makes you adjust your objectives, it is difficult to re-plan the route that you established at the beginning of the year. And it gets more difficult when you are part of a larger team managing a plan. Keeping everyone headed toward the same destination with the rapid pace of change in today's world is a real challenge. Based on my experience with 1980s map books, it probably isn't that surprising that I decided to build Plannuh. When I am navigating in my car in 2018, the GPS alerts me that the road ahead might be challenging and recommends and alternative route. I want that same experience with my marketing plan. As my goals (destinations) evolve and the market (traffic) conditions change, I look forward to seeing the message that is the equivalent of: "traffic conditions changed, we found a better route..re-calculating."